Sciatica hip pain can last for weeks and cause excruciating pain to the point that it can rob us of our daily activities. From the time we are infants, we depend on our hips to move. Any damage to the adjoining sciatic nerve can hinder these movements. The hips are not the only ones affected by pain. It can also cause pain in the legs and buttocks, as the sciatic nerve runs from the spinal cord to the feet. We will look at the causes of sciatic nerve pain, known as sciatica, and how this presents sciatica pain in hip. We also explore alternative treatments to relieve sciatic hip pain. Can sciatica cause hip pain? Sciatica and hip pain go hand in hand, as the sciatic nerve connects various nerves from within the spinal column that runs along the hip, buttock, leg, and into the foot. Sciatica causes hip pain when the sciatic nerve is compressed. It can occur with inflammation, degenerative disc disease, a bulging or ruptured disc, or with a spinal stenosis condition. Regular repetitive movements we do while running, jogging, squatting, and cycling can cause the pelvic muscles to become worn and damaged, which can result in inflammation and pain of the hip joint. Compression of the sciatic nerve can occur with internal health conditions, as well as with trauma or injury to one of the discs in the spinal column. A slipped disc is the most common injury to the sciatic nerve. It includes the disc moving out of place, as well as rupturing or bulging against the nerve. Infection or tumors can also cause sciatica hip joint pain. In the elderly, spinal degeneration due to the aging process can cause irritation of the sciatic nerve. Aside from age, other factors associated with sciatic hip pain include pregnancy, smoking, obesity, prolonged sitting positions, and any repetitive movement that involves carrying heavy objects or twisting of the back. We must look beyond common hip pain and sciatica symptoms, as the pain itself can range from minor to extreme. Sciatic hip pain may begin as a gradual burning ache or may be a sudden, sharp pain. Other symptoms that may accompany these sensations include numbness, tingling, and weakness. When we have pain in the hip region, it may be hard to distinguish the type or primary cause of pain. Sciatica hip pain radiates in the lower back to the hips, and continues along the nerve down the leg, past the knee. It can intensify with lifting, sitting, coughing, or sneezing. You can expect the symptoms to be intense during the initial stages, with pain decreasing over time as the inflammation subsides. This condition usually lasts four to eight weeks. Severe cases may last longer and cause leg weakness, as well as the possible improper functioning of the bowels and bladder. This situation indicates nerve damage that requires medical attention. There are various treatments for sciatica conditions, including the use of prescribed and over-the-counter pain relievers and anti-inflammatories. Use of hot and cold compresses and alternative therapies of acupuncture and ultrasound may also relieve symptoms. We have outlined four common exercises for sciatica hip pain. The hips have trigger points to target pain and offer relief. You can do this using tennis balls, foam rollers, and tubes. Lie on your back with your legs extended onto the floor. Then, pull the leg of the affected hip towards your chest. Hold it with one hand and grasp the ankle of the same leg with the other hand. Now, pull your knee towards the opposite ankle until you feel a stretch. Hold for 30 seconds and return to original position. Repeat three times. Lie on the floor with your legs extended onto the floor. Raise the leg of affected hip and put your foot on the floor on the outside the opposite knee. Pull the knee of raised leg across the midline of your body with other hand or with a towel. Once you begin to feel a stretch, hold for 30 seconds. Then, return to original position. Repeat three times. Lie on the floor with the leg of affected hip crossed over the other leg at the knee. Both legs should be bent. Now pull the lower knee towards the shoulder until you feel a stretch. Hold for 30 seconds and return to original position. Repeat three times. Get on all fours on the floor. Move the leg of the affected hip underneath your body to have the knee of this leg resting on the floor on the opposite outer side of your body. Extend the other leg straight back, keeping the pelvis straight. Keep the affected leg in this place as you move your hips backward towards the floor, leaning onto your forearms. Once you feel a stretch, hold for 30 seconds and return to the starting point on all fours. Repeat three times. Sciatica hip pain can turn your world upside down. 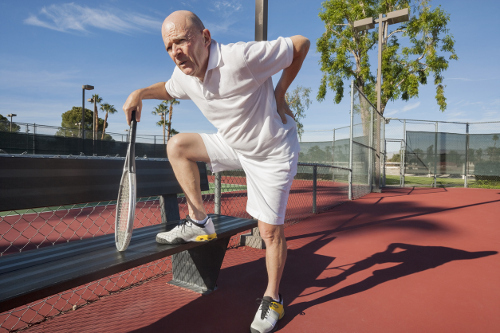 The pain can be debilitating and can stop you from working and enjoying daily activities for weeks, if not months. The sciatic nerve runs from our spinal column right down to our calves. Any trauma, damage, or injury to the nerve, such as compression, can cause numbness as well as pain. Severity will depend largely on the extent of the pressure on the nerve. Whether the cause is a herniated spinal disc or infection, you can alleviate sciatica nerve pain may with exercises in the comfort of your own home. Eanes, B., “2 Causes Of Hip Pain And How To Treat Them: Sciatica And Piriformis Syndrome,” Breaking Muscle; https://breakingmuscle.com/fitness/2-causes-of-hip-pain-and-how-to-treat-them-sciatica-and-piriformis-syndrome, last accessed June 26, 2017. “Sciatica – symptoms, pain relief, treatment, prevention,” Southern Cross; https://www.southerncross.co.nz/group/medical-library/sciatica-symptoms-pain-relief-treatment-prevention, last accessed June 26, 2017. “Sciatica | Hip Pain,” Laser Spine Institute; https://www.laserspineinstitute.com/articles/sciatica_articles/hip_pain/135/, last accessed June 26, 2017. Ingraham, P., “Massage Therapy for Back Pain, Hip Pain, and Sciatica,” Pain Science, May 15, 2016; https://www.painscience.com/articles/spot-06-gluteus-medius.php, last accessed June 26, 2017.